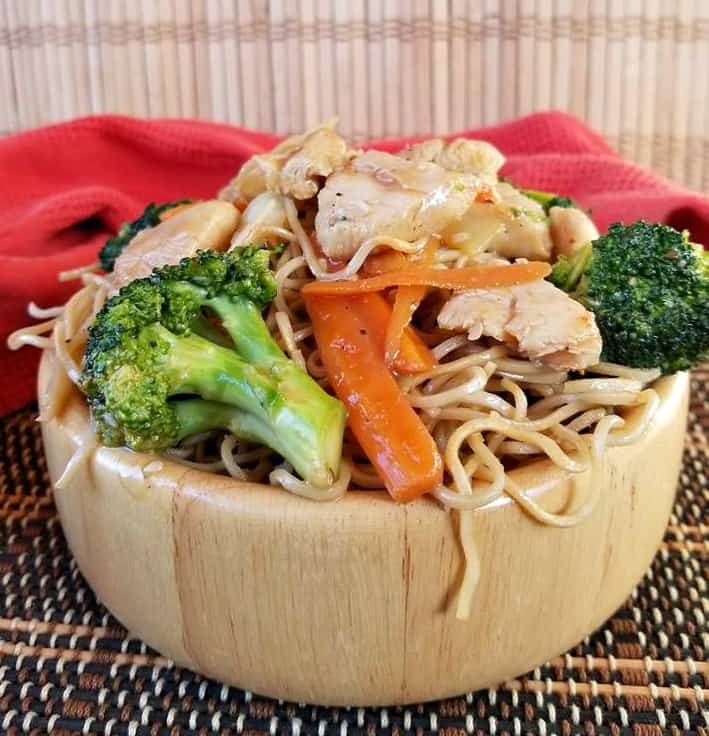 This Spicy Chicken Ramen Noodle recipe is also known as the popular takeout dish Chicken Chow Mein. It’s so satisfying, you’ll be craving this the day you try it! You probably would not know it, but making this dish is simple as can be. It’s also fresh and can be all pulled together in less than 20 minutes! Made with crispy broccoli, carrots along with melt in your mouth cabbage that your sure to love. 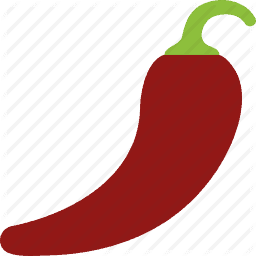 You can make this dish as spicy as you like by simply adding in more or less of the “red pepper chili paste” I have made this recipe medium spicy, so even the kids can enjoy this dish with you. 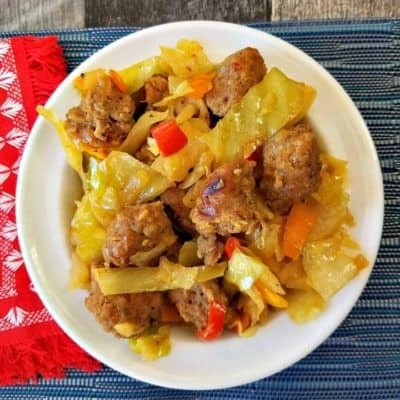 Sure you can head out to your favorite chinese restaurant for something similar or you can learn to make it at home for a fraction of the cost. Plus when you make this at home, you can ensure there is no msg added or any other ingredient that your not sure of. 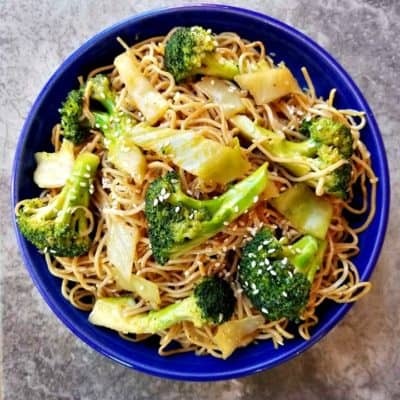 Once you learn to make this simple chow mein dish, you will be making it more often Guaranteed! 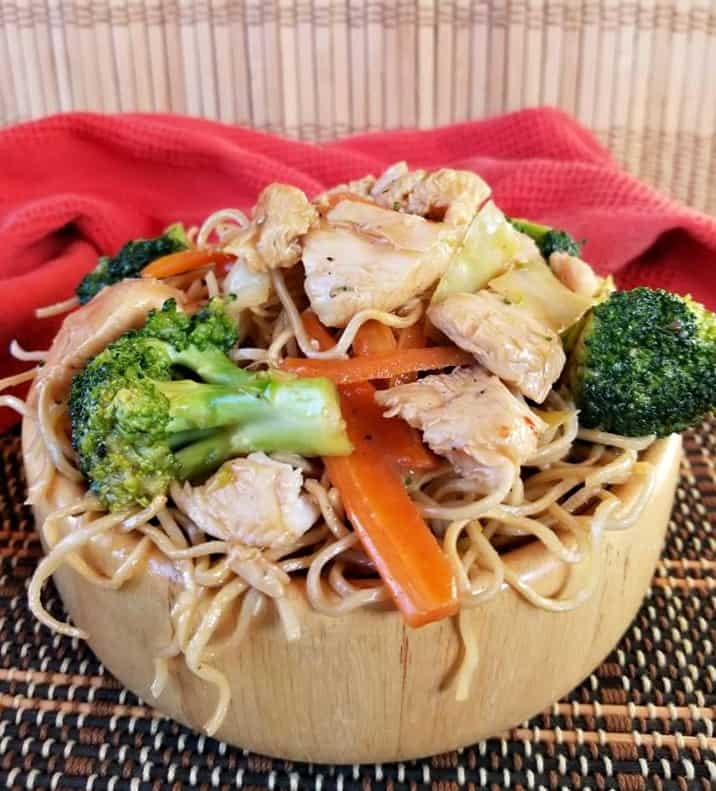 It’s my go to Chicken Ramen /Chow mein dish, very very tasty! I’m the type of lady that has to try every chow mein dish whenever we go to the chinese restaurants. I do this to compare really, just kidding. Well kinda, I mean some restaurants do it right and others so wrong. Right? It’s not always easy to find a good chow mein these days. 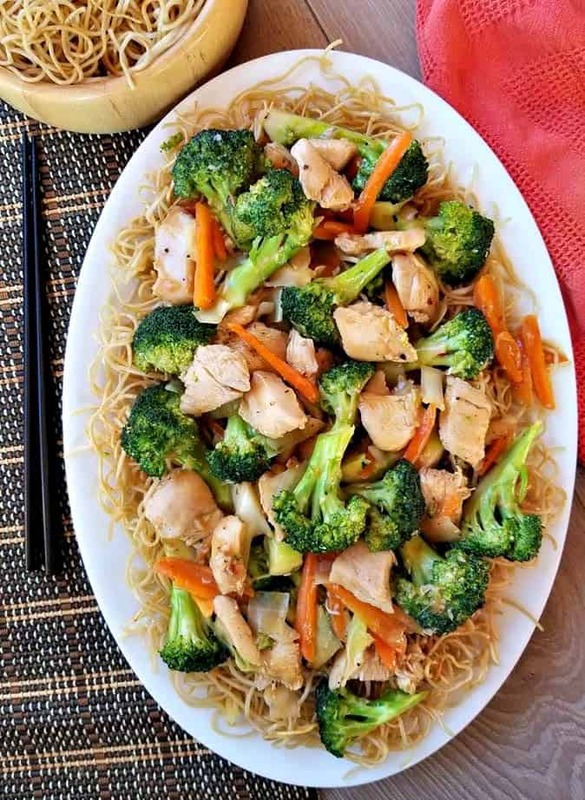 But with my recipe it’s foolproof, if you follow it to a tea you will be in Chow Mein Heaven! So please skip the takeout tonight and learn to make this iconic dish in the comfort of your own home. Impress yourself, I know you can do it! The brand I like to use can be seen below, it is very low in sodium! 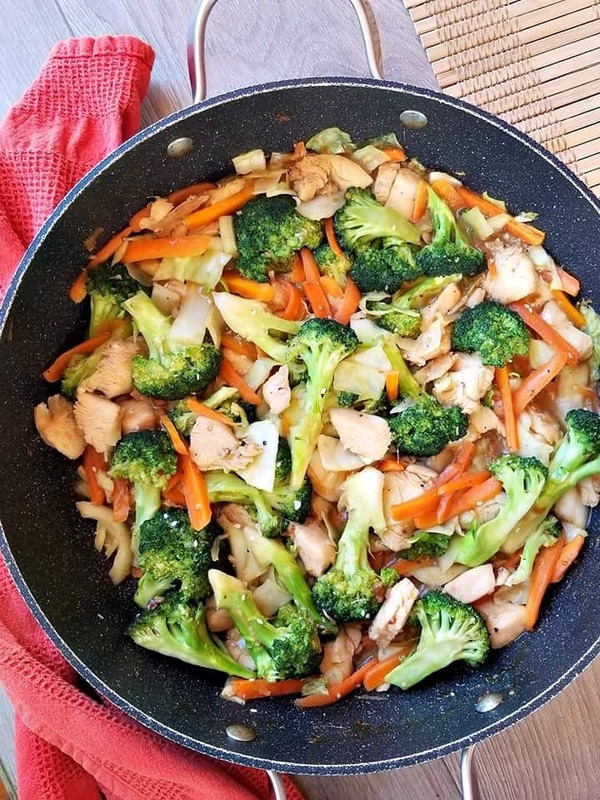 The chicken and veggies are tossed together in the most delicious asian inspired sauce. And the chow mein noodles are fried just a bit to give it the perfect amount of cripsyness. I use a combination of olive oil and sesame oil to fry my noodles, however you can use regular cooking oil if desired. That is what most restaurants use anyway, then a dash of sesame oil just for flavor. The hardest part about making homemade chow mein is “chopping those vegetables”. Once you have that part done, the rest comes together in a snap. Actually being that this is a Vegetarian dish, it can be pulled together in less than 30 minutes. 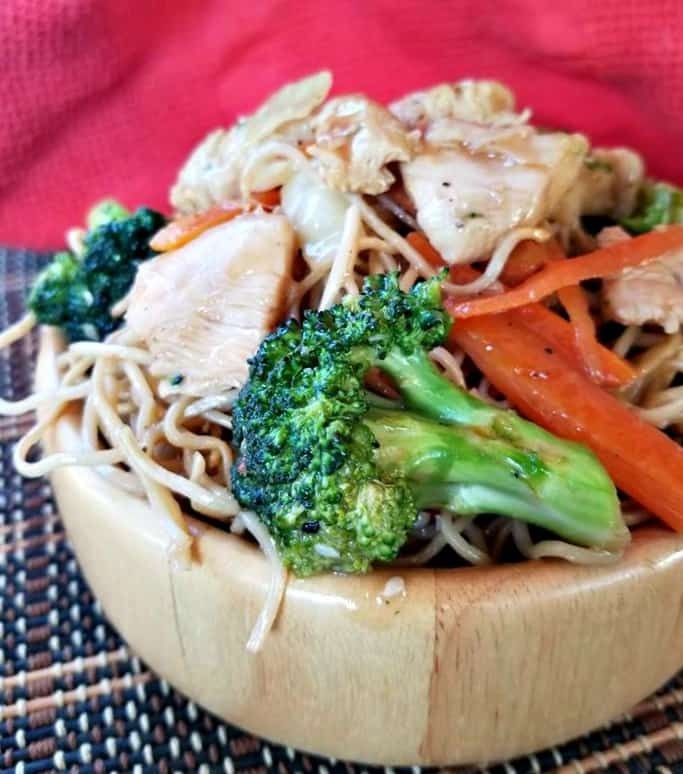 I have experimented with a few chow mein recipes over the years and promise you your going to love this one. 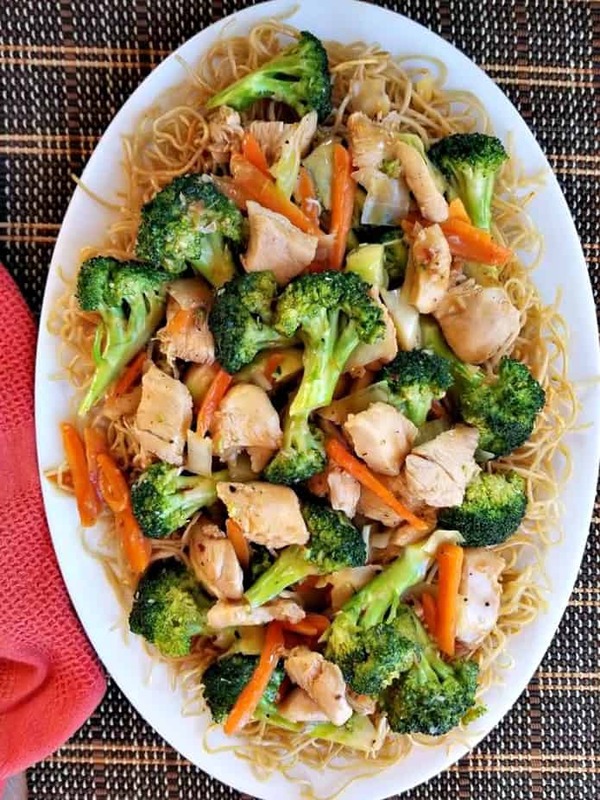 Chow Mein is one of my favorite asian dishes, I will order it everytime I go to my favorite asian restaurant and I will also order it when I try new asian restaurants. 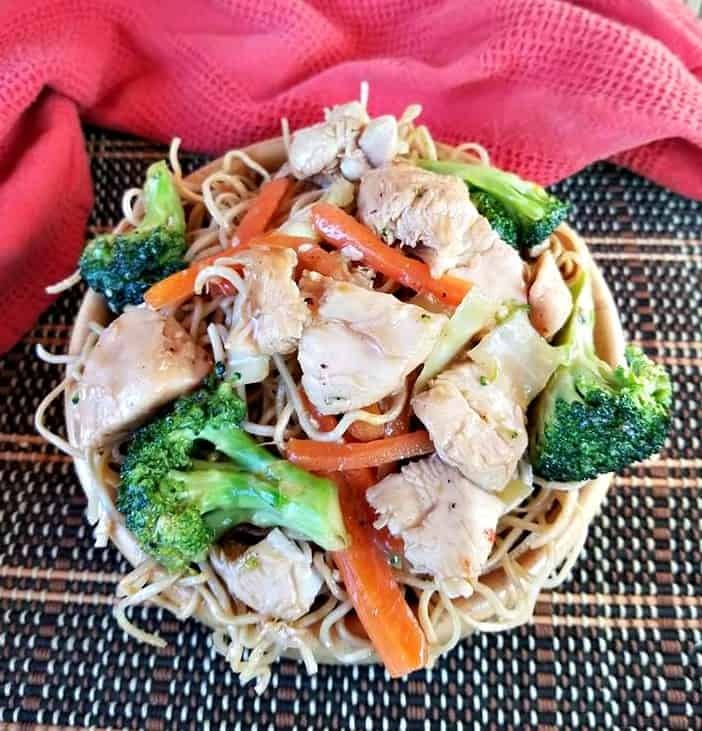 Some restaurants make their chow mein better than others, typically it has allot to do with the type of ingredients that are added to the noodles. 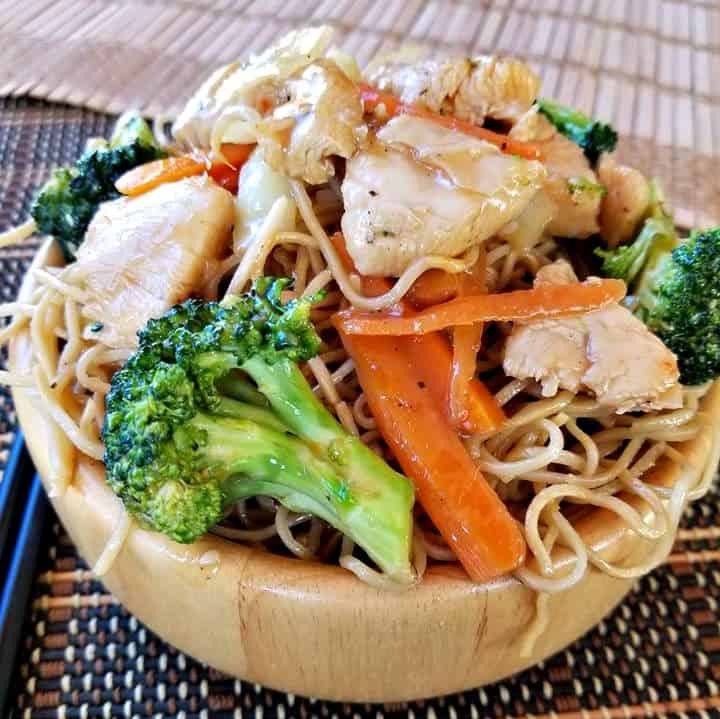 If you liked this dish, then stay tuned to this blog as I will be sharing my all time favorite recipe for seafood chow mein very soon, which contains fresh calamari and shrimp. 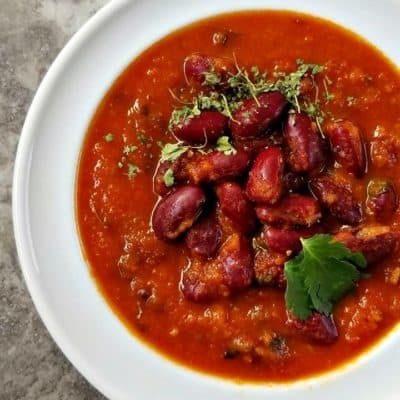 I am so thrilled you are reading one of my recipes, if you made this recipe i’d love to hear about it in the comments below. Don’t want to miss a recipe? Sign up for our NEWSLETTER delivered right to your inbox every Month! Start by cooking the noodles, to do that add them to a large pot of boiling water. 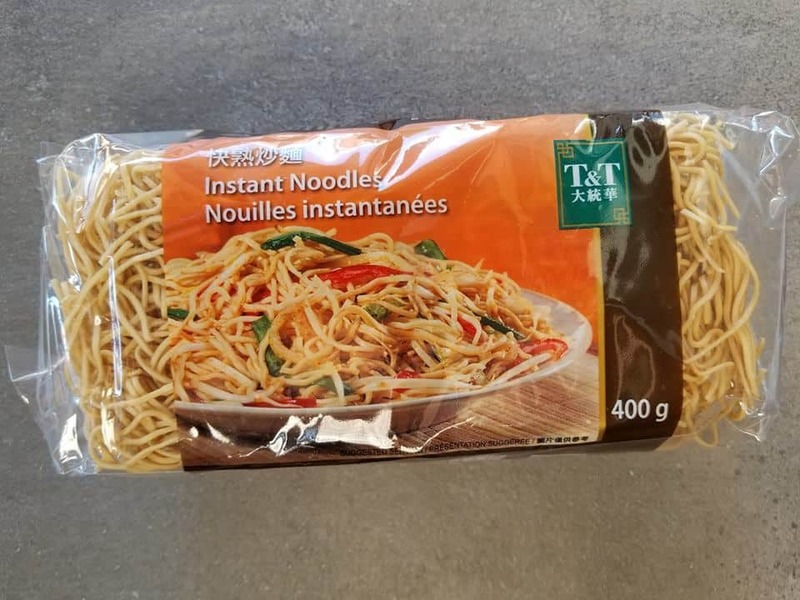 Cook according to package instructions, with dry noodles it's typically 5 minutes. Meanwhile add all your sauce ingredients to a medium sized bowl and whisk to combine. On a large chopping board, chop the broccoli into bite size pieces along with the cabbage. On another cutting board dice the chicken breasts. Add the chicken breasts to the marinade and marinade in the fridge for 15 minutes! 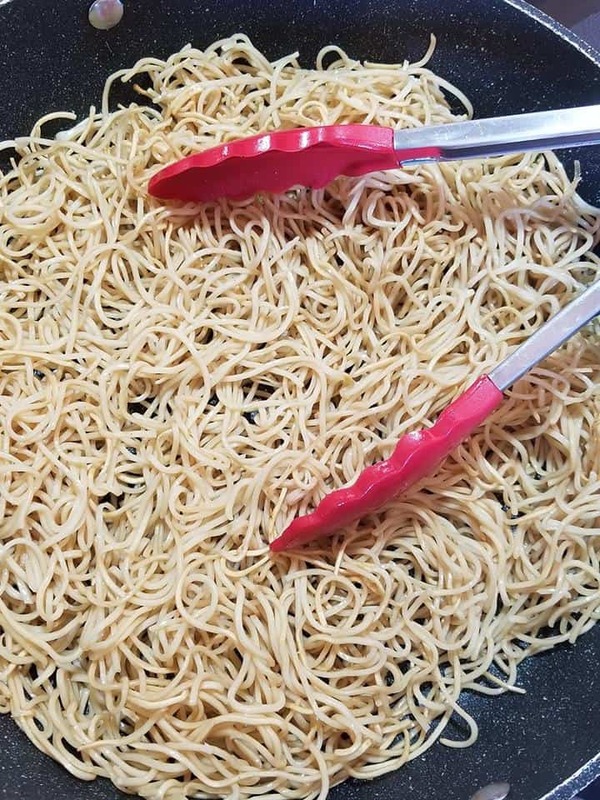 Once the noodles have cooked remove them from the water, strain and set aside. Now is the time to make those noodles a bit crispy. 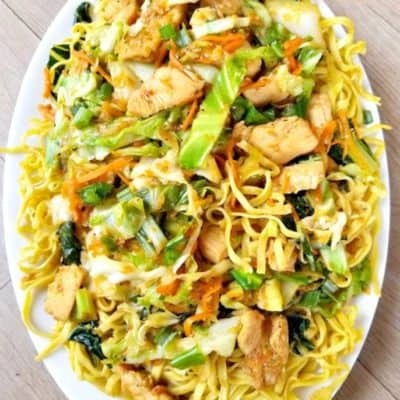 Simply add 2 tbsp of sesame oil in a large frying pan along with the olive or cooking oil and saute those cooked noodles on each side till slightly crispy and browned to your liking. In the same pan/pot/wok add the marinated chicken and stir fry till cooked, pour in the remaining marinade along with chopped ginger and garlic. Saute for 2 minutes before adding in all the chopped vegetables, simmer on medium heat for roughly 5 minutes, tossing often until the vegetables are crispy yet tender. 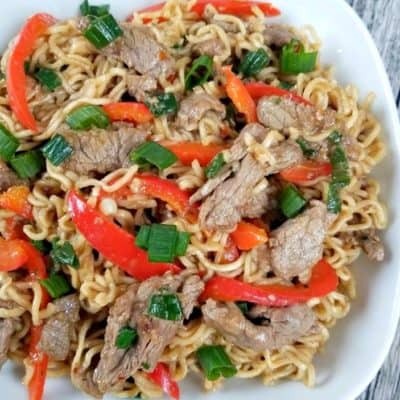 Serve over the noodles hot and enjoy! This was my first time making homemade Chow Mein anything! It turned out better than I thought!